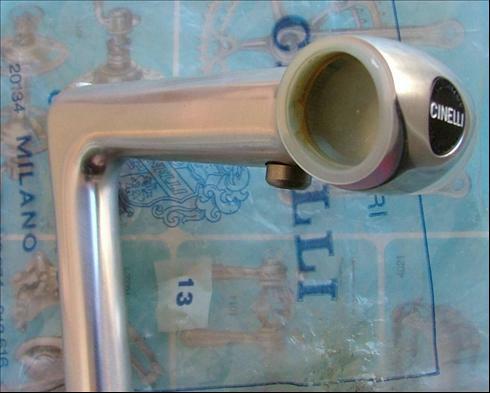 The 1R along with the similar designed XA aero styled stems from Cinelli were introduced in the late 1970's and 1980's. The 1R's bar clamp design is different from that of the XA and other cinelli stems. Its bolt pushes a plate up against the bar from the back side, securing the bar in place. This version has the word 'Cinelli' across the front insert instead of the more common and later winged Cinelli 'C' emblem. The top engraving is also of an older style than later stems. Came also in French quill size of 22mm - you can tell if it's French by the dimple that it has right after the split in which the expander bolt fits.